Someone emailed this to me, it is supposed to be around George West and looks pretty real to me. If so this is the biggest rattler I have ever seen!!! 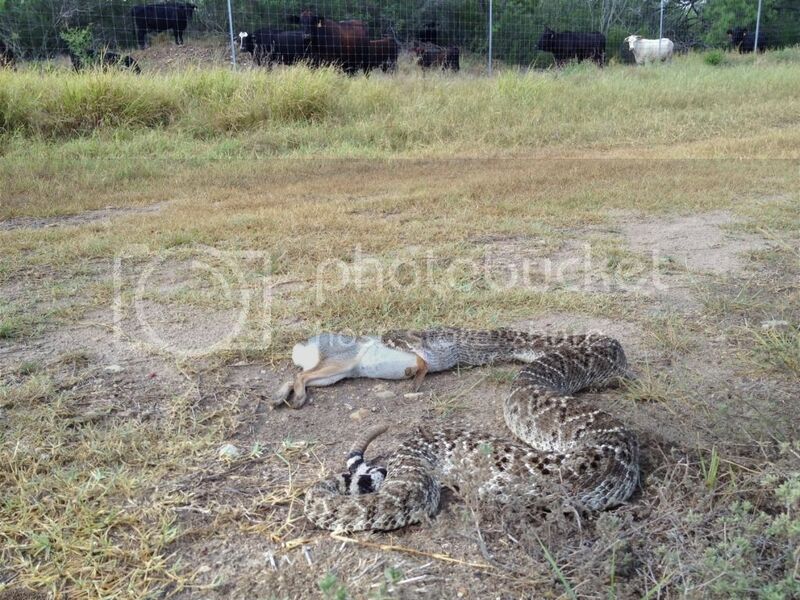 that is a protein feeder for them damned high fenced rattlers. Impressive....but isn't that a cottontail? looks like a cottontail to me too. Could be an average size snake eating at baby rabbit too. I will 2nd this except for I will call it an above average snake. Look at the amount of rattles and size of them compared to snake. I'll PM my address for the money. I killed a 6'+ snake in Live Oak county about 20 miles north of GW in the 70's that had swallowed a rabbit like this size one. I agree...for what that's worth! That's impressive, can't tell whether it's real or fake but that thing has some mass! Don't take life so seriously, you'll never make it out alive! Has Killer weighed in on this yet?